World Cafe: 5 Bands That Got Their Start On Bar/None Records : World Cafe As the influential New Jersey label celebrates 30 years in the business, World Cafe looks back. 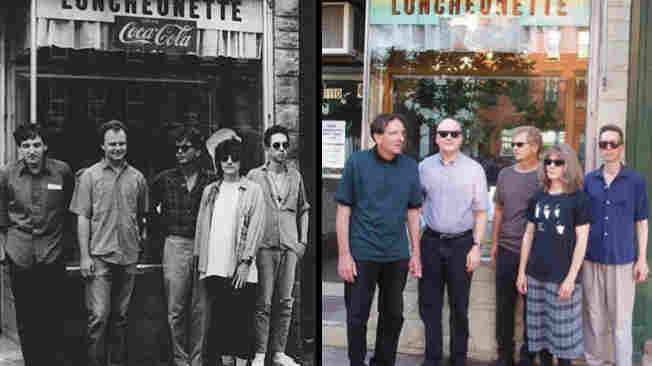 The Feelies in a press photo from 1988, and standing in front of the same diner in 2011. Today, World Cafe looks back at the small but influential Bar/None Records label. Bar/None was formed in Hoboken, N.J., 30 years ago by Tom Prendergast and Glenn Morrow. Prendergast sold the label to Morrow in 2000. They were the first label to record many artists who later jumped to bigger imprints, including They Might Be Giants, Freedy Johnston, Yo La Tengo and others. Here, Morrow joins the show to discuss some great music. Hear five bands, originally on Bar/None, that later signed to bigger labels. The playful North Jersey indie-rock band released two albums (including Talon Of The Hawk) and a couple of EPs for Bar/None. They Might Be Giants was Bar/None's first great success before the band was later signed by Elektra. Chicago singer-songwriter Ezra Furman's second album came out on Bar/None. Freedy Johnston's 1992 album Can You Fly was one of Bar/None's biggest critical successes: It led to the Kansas-born singer-songwriter getting signed to Elektra. The New Jersey band The Feelies did things with Bar/None in reverse. Its records were originally issued by A&M, but later got reissued by the label.